Cozy up on the sofa with this Boon Knitted Tweed Couch Throw. This throw is soft and comfy, and it features a loose knit design that can easily be adjusted back to its original position by rubbing between two fingers. Available in a wide variety of colors to best fit your decor needs, this throw blanket is conveniently machine washable. I purchased the Boon Knitted Couch Throw in what looked like a peach color but when I received it, it was a 'tan' color, not the peach color I'd hoped for. Although the throw is of great quality, the color didn't quite fit my decor so I'm returning it and ordering it in a different color. This blanket is soft and nice quality, but beware if you are buying the color in the picture that looks like a pretty blush pink/brown. It's straight up brown in real life. Disappointed that the picture drastically misrepresents the color. 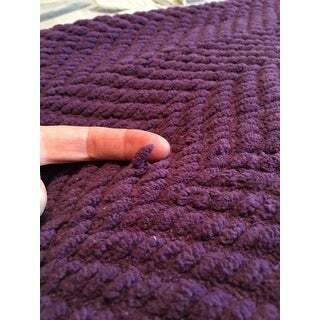 The blanket has a wide stitch with a thick yarn so it easily gets pulls. Also I had hoped it would be a little longer to sit at the foot of my queen bed. It covers the width of a queen but does not hang over the sides. I bought 3 as gifts for my grown children and their families. They each called to say they love the softness, warmth, and feeling cozy while wrapped in them. The colors were nice also. I wanted them to be easy to care for so they had to be machine washable. They were a very positive gift so I was very pleased I had made a good choice. 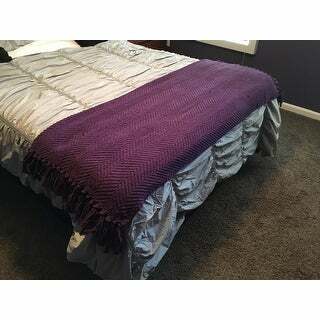 I love this throw, It is very soft and comfy and the color is perfect....exactly what I ordered. Pleasantly surprised with the color and texture of this throw. Love the color and the softness. Will order another when it's available and green. Yes, I would recommend to anyone. Love the color not a bright color very suttle as I put on my grey couch , to bring the color into the room as I purchased a chair from OS and needed the colors brought together in the room. Soft, but is thick. 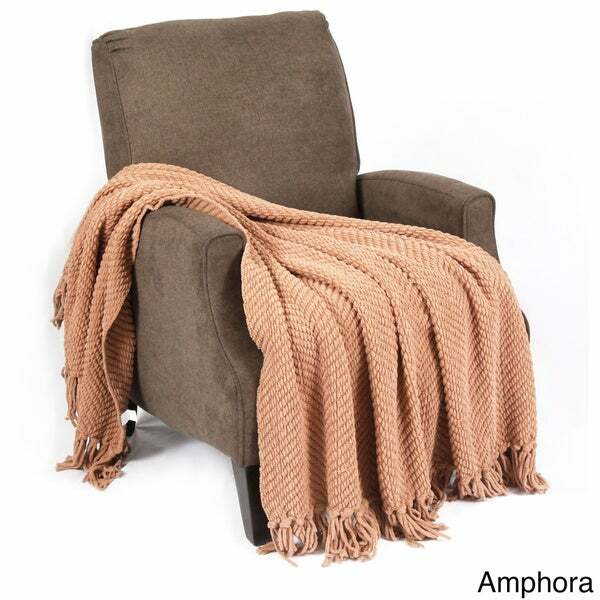 I am returning this item, as the color from the photo showed an almost blush orange, yet the actual color is a darker mush brown (almost the color of the chair the throw is laying on). Not what I expected at all, and I'm very disappointed. Up until now, I've had nothing but wonderful experiences with all my Overstock purchases, but this one is not what I wanted. On accent item purchases, color is usually very important in the decision to buy, so I suggest this provider take better photos that are truer to color. The color of this item is light brown not peachy pink. Sending it back. Makes a great gift,and makes a good companion for rainydays or when you have an under the weather dilemma! "How do I pick Blue Wing Teal in the options?" Unfortunately the blue wing teal is out of stock at this time. "Is this silver in stock?" The silver is in stock. Thank you! "What Are the size dimensions of the blanket? Thanks!" The dimensions are approximately 50 x 60 inches. "When will the Citron color be in"
Unfortunately we don't know when the Citron will be back in stock. We apologize for any inconvenience we might have caused. The Citron is now in stock. Thank you!